Let me start by saying I’ve been exactly where you are – a financial advisor, or mortgage rep trying desperately to figure out how to drive traffic to my blog, or website by writing SEO friendly blog posts. Believe me when I say that I know a thing, or two about how difficult it is to produce content that ranks well in search engines. And even when you manage to get your post to rank high getting traffic to convert into leads can prove to be equally if not more difficult. I feel your pain! That being said it’s important not to give up trying to improve your page rank in Google, Yahoo, or Bing. Learning to write blog post that search engines find friendly is critical to quality lead generation because according to a study found on Search Engine Watch results in the top listings in Google receive 33% of the traffic, compared to 18% for the second position. That’s a huge drop! A keen focus on SEO is important simply because the statistics can’t be denied. The numbers tell us that if a Financial Advisor wants to be on the top of a search engine results page (SERP) then simply writing content won’t get them there. Focusing on SEO-driven, keyword-rich content is important to attracting not just a search engine but the type of reader that will convert. Ok…I know the wheels in your head are churning by now and you’re wondering just what you need to do. 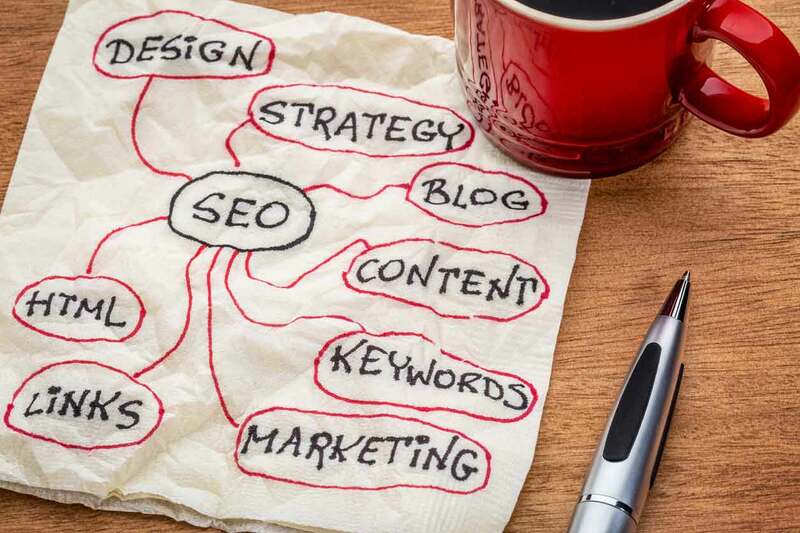 Below you’ll find 5 things you can do today…or tomorrow to help you figure out just what SEO keywords to use to drive traffic that will convert to your website. Google is a shear beast. The search engine now processes over 40,000 search queries every second on average (which translates to over 3.5 billion searches per day and 1.2 trillion searches per year worldwide. With that much traffic being processed you might be wondering where to begin. Start by targeting the specific keywords and phrases your potential customers are searching. There’s no other way for potential customers to find your website. Here are a few tools to help you identify keywords and phrases that may be trending for your business. Auto Suggest – I don’t think there’s a better place to start. Have you noticed that when you type a query into the Google search engine it will try to auto-complete it for you? It’s basing it’s guess on actual search queries. Both Google and Bing provide this. In addition to attempting to auto-complete your query at the bottom of the search engine results page you will notice Google provides a section called ‘Searches Related To…(your keyword)’. In the example below I typed in the search bar the phrase – choosing a financial advisor. Notice that at the bottom of the SERP Google offered a number of excellent long tail keyword phrases you could write a blog post about. To identify those hot keywords, head on over to the social platforms your target audience frequents and see what’s trending. Pay close attention to the exact phrases they use and monitor popular industry terms and topics. Google Trends: I find myself using Google trends a lot. Not just for content I develop for this blog, but also for content we develop for our clients. One of the things I like best is that Google Trends offers the ability to analyze keywords. When you’re trying to narrow down a list of keywords or phrases to a single one to use in a post in-depth key word analytics can be helpful. Here’s a few of the things I like most about Google Trends. Google Trends will even tell you which keywords are rising and by which percentage (use this to target keywords that your competition may not have thought of using yet). Best of all Google Trends is completely FREE!! I like free high quality free stuff. Don’t you? Moz Keyword Explorer: With this tool you can perform two free searches a day. Type your keyword into the tool and it will give you related terms and phrases. One thing to remain mindful of is that the most popular keywords may not be the best keywords. That’s because the most popular search phrases will likely be the most competitive. In your quest for writing search engine friendly content you may be better off targeting “long-tail” keywords, keyword phrases, and questions. They are often easer to rank for because they are so specific. And according to post on Yoast the longer and more specific the search terms are, the higher the chances of conversion are. Remember the Google auto suggest example a few paragraphs earlier. It offered several long-tail phrases and questions a Financial Advisor could use to build several blog post around. Hubspot suggest that once you’ve done your research and built a list of what you think are the most valuable, relevant keywords, plug them into a keyword research tool like Google’s Keyword Planner, Moz’s Keyword Explorer, Ubersuggest, Keyword Tool and so on. Many keyword research tools give you the monthly volume for any given keyword. Test out different keyword tools — marketers are drawn to different ones for different reasons. You may think that it’s important to rank for high competition, short tail keywords…and it is. But you should also try to build a repository of long-tail keywords that are high in search volume but low in competition. You’ll discover that it’s much easier to rank for these words. Here are two important things to keep in mind for your SEO strategy. Times change and people change. Because of this so will your keyword strategy change over time. So make sure from time to time that you conduct additional research to make certain that you’re still focusing on the best keywords to target your ideal client. Armed with your list of target keywords, the next step in to begin writing a blog post that focuses on preferably one of the long tail keyword phrases. To help with coming up with interesting blog titles checkout Hubspot’s blog topic generator. Buyer personas: keep your ideal client, their challenges, and interest top of mind. Topics: choose topics that your buyer personas will identify with, show them that you feel their pain…that’s how you increase conversions. Don’t keyword stuff. That’s a sure way to get penalized by Google. Instead write in a natural way so your keywords and natural variations will be spread naturally throughout your blog post. Here are the places you want to make sure your primary keywords appear. Although you want Google’s love and approval you’re not writing for them. You’re writing for your buyer persona’s, real people, so use styles and tones to discuss solutions to the things that keep them up at night. It can be tempting to repeat keywords in your text thinking that frequent use will increase your rankings. Don’t Believe The Hype! Keyword stuffing is more likely to get you a stiff penalty from Google, or possibly banned. But even if Google doesn’t catch you keyword stuffing makes for a poor user experience. Ultimately you’re trying to become a resource for your buyer persona’s and you don’t want to run the risk of insulting them with poorly written material. Linking to trustworthy sites, and the heavy hitters (other bloggers, journalist, institutional websites with lots of followers) in the financial services space has 3 key advantages for improving SEO friendliness. It offers your readers additional knowledge points. Notice the number of times I’ve provided links back to Google, Hubspot, and other sources to show proof of the statistics mentioned, and to offer additional resources for reference. At this point don’t worry about losing your reader because your referring them off of your site. Your goal, as always, is to become the trusted advisor. Believe me if they are searching on the Internet for financial advice and those other sites that you might link to already have better rankings than you…then your reader is likely to discover them any way. According to a Microsoft study thanks to the internet and digital devices humans now have shorter attention spans than than gold fish. That bit of inside insight naturally leads us to think we should be creating shorter blog post. Maybe slightly longer than a Tweet. But hold your mule! Google says that while it’s true that users most often look for a quick answer, about 10% of their users seek out longer in-depth articles. 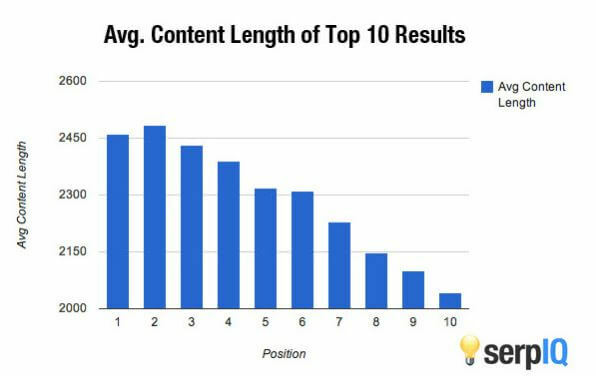 In 2012 the folks over at SERPIQ conducted research to determine how important content length is to SEO ranking. They discovered that longer blog post have better chance of ranking well in search engine results pages. The top ten pieces of content all have more than 2,000 words. It also showed that the 10th result had 400 fewer words than the top results. This clearly demonstrates the SEO benefit of long form content. So if you want your site to rank well consider investing more time, or money producing in-depth blog post. If you’re worried that longer blog postings are going to drive your readers away, then here are a few tips to try and keep them engaged. Don’t be boring. Long content is not the enemy here. An inability to keep them entertained, and well informed is. Make content easier on the eyes by using columns classes, and bullet points. Using these strategies you can create longer content that’s more informative, and easy to consume. Want to know a really easy thing you can do that will help search engines crawl your website and create more accurate sitemaps, help your readers discover more of your content, lower your bounce rate, and increase your conversions? Build internal links. Earlier in point #3 I told you about the advantage of linking to authoritative domains, bloggers, and journalist. Those links going out, therefore away, from your site are called external links. Internal links are links from one content source on your site to another content source on your site. Meaning you are linking to your own stuff. There are 3 benefits to setting up internal link structures for your blog or website. You can improve your SEO rankings by linking from pages on your blog that rank well to content pages on your site with lower rankings. Checkout our guide 10 Tips For Better Business Blogging for more insights. Internal links are effective content marketing weapons in the battle to lower bounce rates because they act as guides to direct your readers to additional useful content on your site. Internal links also a great marketing tool to grow customers as they can serve as effective calls to action (CTA’s). When building links to other pages on your website remember to use language that flows naturally, and that accurately describes your anchor text. Like I did above. Beware: don’t overdue it by putting too many links in a single post. Especially shorter blog post. Longer post can sustain more links because of the length of the post. The most important thing is that the internal links you provide are actually helpful in directing your readers to useful content. Never create a link just to try and up your rankings. In the end what you are really after, from a purely SEO perspective, is for your content to rank high on page one of search engines. For that to happen you’ve got to produce content that endears itself to both search engines, and humans. If you do you’ll have the best of both worlds….content that ranks high, and converts well.